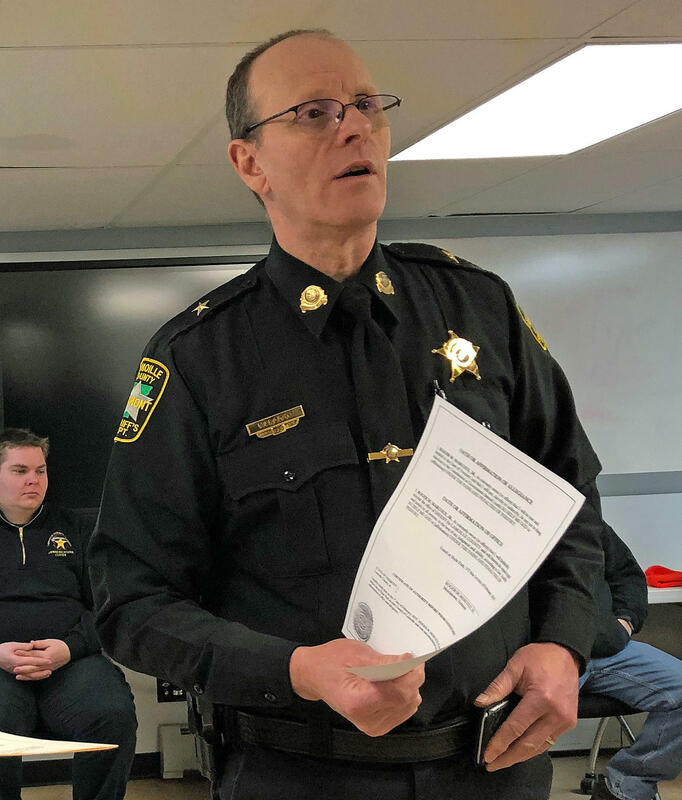 Lamoille County Sheriff Roger Marcoux swore in a room full of deputies on Friday, Feb. 1. Some of his more mature deputies are hired specifically to work with people experiencing mental health crises. A shortage of mental health treatment beds in Vermont has forced hospital emergency rooms to provide unprecedented levels of psychiatric care in recent years. Many of those ERs have used sheriff’s deputies to supervise violent or disruptive patients, but officials now say that practice runs afoul of federal regulations. For patients in the throes of an acute psychiatric episode, ER stays can last for days, while doctors wait for an in-patient mental health bed to open up. “So that’s just an enormous stress on our emergency departments right now,” said Devon Green with the Vermont Association of Hospitals and Health Systems. Green says hospitals sometimes call in sheriff’s deputies to keep an eye on agitated patients. But according to Commissioner of Mental Health Sarah Squirrell, it’s an arrangement that could cost hospitals the federal certifications they need to stay open. That’s because federal regulations prohibit non-hospital employees from putting their hands on patients. Gov. Phil Scott is now asking lawmakers to eliminate state funding for sheriff supervision in hospitals. The administration wants the money be cut off starting April 1. 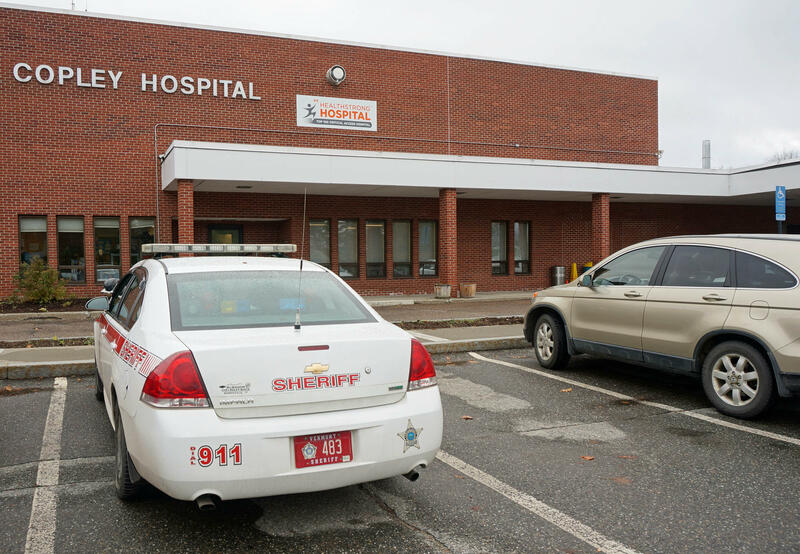 This Lamoille County Sheriff's Department car was parked outside the Copley Hospital emergency department in Morrisville in 2016. "Law enforcement is used to augment our staff," Michael Brigati, the emergency department nurse director, commented at the time. Hospitals though, especially smaller ones, say the decision could put them in an impossible bind. Larger institutions, like the UVM Medical Center, have been able to increase in-house mental health treatment capacity. But Green says hospitals in rural areas just don’t have the resources to keep up. Take away the ability to call in a sheriff’s deputy, and Green says it’s unclear who’s going to fill that role. The state has not offered detailed plans for how emergency departments should cope without sheriff's deputies. But Squirrell said the state will look for ways to help hospitals make the transition. Lamoille County Sheriff Roger Marcoux worked with the Vermont Department of Mental Health to develop a more dignified way to transport and watch people experiencing mental health emergencies. If lawmakers push forward a plan to end state funding, local sheriff’s departments would also feel the impact right away. The Lamoille County Sheriff's Department has taken a lead role in trasporting and watching people in mental health crisis. 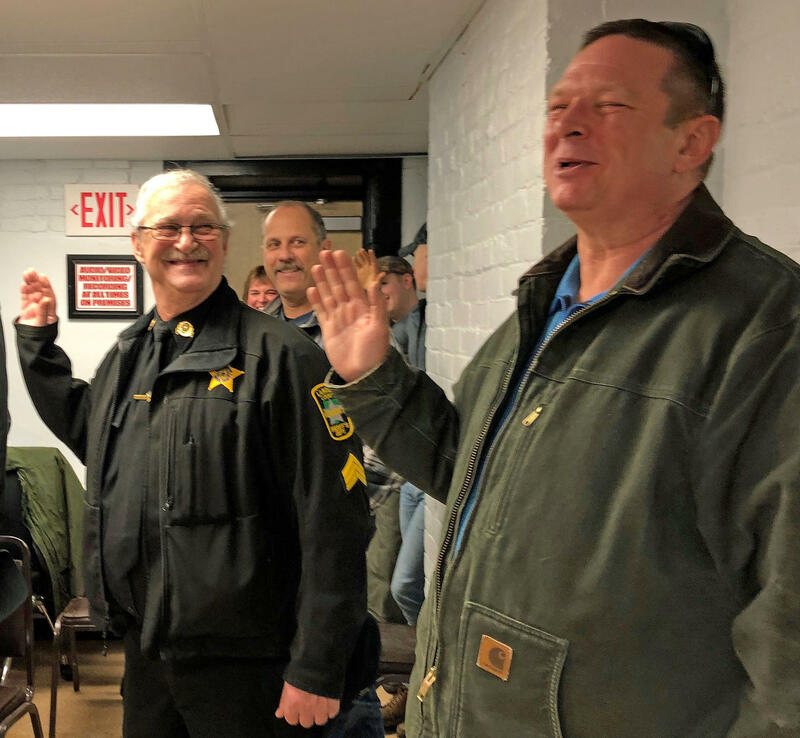 Last Friday, Lamoille County Sheriff Roger Marcoux swore in a room full of deputies. But not everyone taking the oath fit the stereotype of an early-career sheriff’s deputy. Marcoux was among the first to react when the Vermont State Hospital in Waterbury closed in 2011, and people in mental health crises started showing up in emergency rooms. Marcoux landed contracts for his department to transport and sit with patients in hospitals across Vermont. It’s been lucrative. The program eared about $120,000 for the department last year. But Marcoux says patients benefit too. He says he's been able to train deputies to balance a patient's dignity with safety concerns. “They are real leaders in utilizing least restrictive restraints and practices, and have been really committed to using trauma-informed perspectives, and really protecting the dignity of people experiencing a mental health crisis," she said. Some Lamoille deputies are retired officers from other departments. Deputies Larry Pecor, left, and Eric Dodge, right, both retired from the Morristown Police Department. At a time when patients were often handcuffed and transported in squad cars, Marcoux told his deputies to avoid using restraints. He gave them civilian vans instead of marked cars. He had them work in pairs and told them to use force only as a last resort. While the state may end contracts to have sheriffs' departments watch patients in hospitals, Squirrell says it will still pay sheriffs to transport those patients from the hospital to a mental health facility when a bed becomes available. But Marcoux says performing that job alone may not make financial sense for his department. “I have to be a good businessman and I can’t keep up the same level of infrastructure and keep those folks on board if it’s not needed,” he said. Marcoux said he has a lot to consider before making any staffing decisions. He’s hoping to have some of his questions answered this week in meetings with Squirrell and the Vermont Association of Hospitals and Health Systems. People experiencing a mental health crisis in Vermont don’t always have swift access to therapeutic care. And that’s a problem with no easy solution. Vermonters have a new way of reaching help when they are having a mental health crisis: the Crisis Text Line. People can text the initials "VT" to the number 741741 and a trained crisis counselor will respond within 5 minutes. A shipping container filled with firefighting gear and school supplies from Vermont will soon make its way to Tanzania. It’s the result of a high school service learning trip last summer.